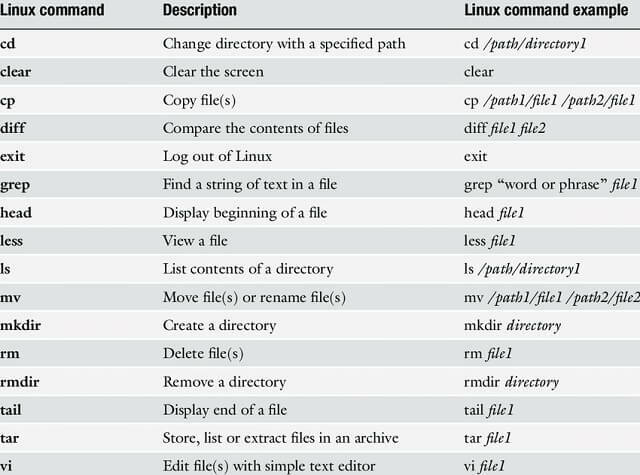 history Display recently used commands.
! Repeat a recently used command. whatis Display a brief description of a terminal program. cp Makes a copy of a file. rmdir Delete file or files. locate Search for files or directories. cat Display the contents of a text file. chmod Modify the read, write, and execute permissions file. apt Programs for installing software and updates. jobs Display the status of all current jobs. ps Display a list of running processes. top Displays a list of running processes, sorted by how much CPU each uses. ping Send or receive data from another computer on a network. Echo Display a line of text.